"Today at the TechEd North America 2010 event Microsoft has confirmed Windows Phone 7 developers will be able to register a number of devices which unlocks the capability to side-load applications on to devices directly from development tools such Visual Studio or Expression Blend. 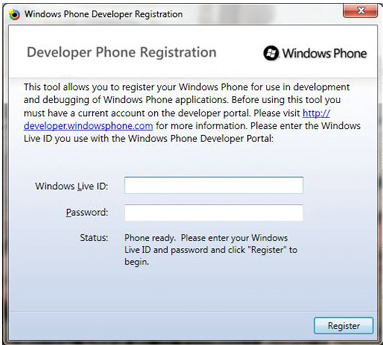 Initially, Microsoft will offer three device registrations per Marketplace account ($99 per year) tied a Windows Live ID. Developers who legitimately require more will be considered by Microsoft on a case-by-case basis." The rumors we were hearing last week are true - Developers will be able to unlock devices without having to buy special "unlockable" devices. Pretty cool - All you need is a phone, a $99 per year developer account, a mess of free tools, and a dream to start building! Personally, I feel that the three-device limit is weak, especially when you consider the importance of on-device testing and how many variants of WP7 phones there will be in the market. Microsoft really ought to raise the quota. If Apple can give developers the ability to register 100 devices per year, what's stopping Microsoft? So in comparison, android costs what, $0 to develop for? Have these monkeys actually reviewed their competitors offerings? A further proof that all the limitations of WP7 are artificially set by MS; great strategy...... to loose even more money. Besides is this phone "calling home" every time you boot it up? Last edited by Fritzly; 06-12-2010 at 01:34 PM..